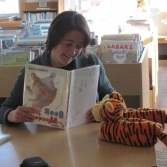 Louise became the Youth Services Librarian in 2009, after working as the assistant in the children's department since 2004. She holds a BS in English Literature and Latin from Boston University. After many years of employment in the retail world of books, she's decided that instead of pushing that extra sale and adding a plastic trinket to a customer's purchase, she prefers adding a favorite book to a patron's already large pile and exclaiming, "It's free!